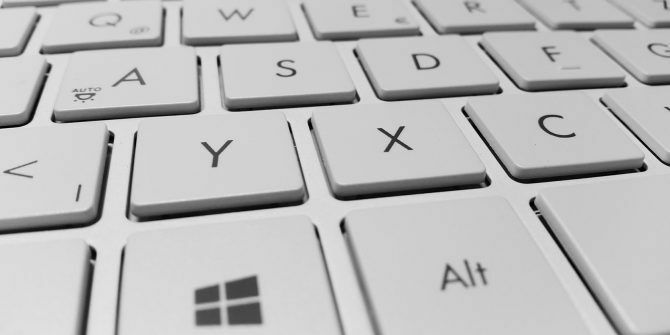 Though you’re probably used to typing on a physical keyboard, Windows offers a few software keyboards too. One is the touch keyboard, which is great for laptops or two-in-ones. When you fold your screen down, it lets you use your tablet PC 5 Reasons to Buy a 2-in-1 Windows 10 Laptop 5 Reasons to Buy a 2-in-1 Windows 10 Laptop 2-in-1 laptops are incredibly versatile. Running Windows 10 they are powerful enough to do office work. They also convert into a tablet, complete with touchscreen, making everything easier. Let us tell you more! Read More without having to unfold it to use the keyboard. The other is the on-screen keyboard. It’s an accessibility tool for users who can’t use a normal keyboard, but you can also take advantage of it if your keyboard suddenly stops working Learn To Navigate Windows Without A Mouse, Keyboard Or Screen Learn To Navigate Windows Without A Mouse, Keyboard Or Screen You just spent hours labouring over an important document when your keyboard dies on you. Would you know how to save your work, exit programs, and shut down your computer? We'll show you. Read More . If you use either one of these, you might be unhappy with its default size, especially if you have a larger screen. Thankfully, it’s not hard to adjust them. Open either keyboard. The touch keyboard will open when you tap on a text field with a touch screen. Search for on-screen keyboard to open that one. Note that the on-screen keyboard will stay on top of other windows. Once your keyboard is open, simply click and drag a corner to expand the size. With the on-screen keyboard, you can click any corner and drag it out like any other window. For the touch keyboard, since you’re presumably using a touch screen, you can tap and hold any corner to drag it to a new size. Once the keyboard is at the size you like, you’re all set. Of course, you can also shrink the keyboard if you find it too large. Hopefully you don’t have to use the on-screen keyboard for long. But at least this lets you change it. Making it smaller means you don’t have to move your mouse as much, while making it larger means you have more room to strike each key. If you use touch on your PC often, check out essential Windows 10 touch gestures 18 Essential Touch Gestures in Windows 10 18 Essential Touch Gestures in Windows 10 Touch gestures are like keyboard shortcuts for your touchpad and touchscreen. And with Windows 10, they have finally become useful! We'll show you how to access the full potential of touch gestures. Read More . Do you ever have to use the touch or on-screen keyboard? What do you use them for? Let us know down in the comments! Explore more about: Accessibility, Troubleshooting, Windows 10, Windows Tricks. 5 Ways to Transfer Data From PC or Laptop to Android PhoneDisk Partition, Clone, Backup: What’s the Difference? I am using the Surface as a tablet, and after using an android tablet with Swype, or Swiftkeys, or even the Google keyboard, it is a major disappointment. I have continued to suggest that Microsoft open up their API for third party keyboards, allow their own subsidary SwiftKeys? to implement a tablet, responsive, swype, and quality correction keyboard, and get some users of tablets to suggest improvements for their tablet GUI. The hardware is good, but both the software, and possibly the tablet interface hardware, are not tuned for tablet operation. I.M.H.O. I'd work with them in the Palo Area, or suggest that they get other tablet users to suggest improvements, but at this time the Surface Widows system has the poorest GUI, of all the phones/tablets that I have used. And the on screen keyboard is perhaps a major cause of this. You are correct regarding the OSK but I have tried everything and I cannot get the touch keyboard to resize. I do not believe it is possible without modifying the registry (which I am loathe to do) and even that may not work with the current version of Windows 10.